former USA National Team Libero, Ranked fourth in the world as a libero in 2006Sarah Drury-Petkovic knows firsthand what it takes to become a championship-caliber libero. 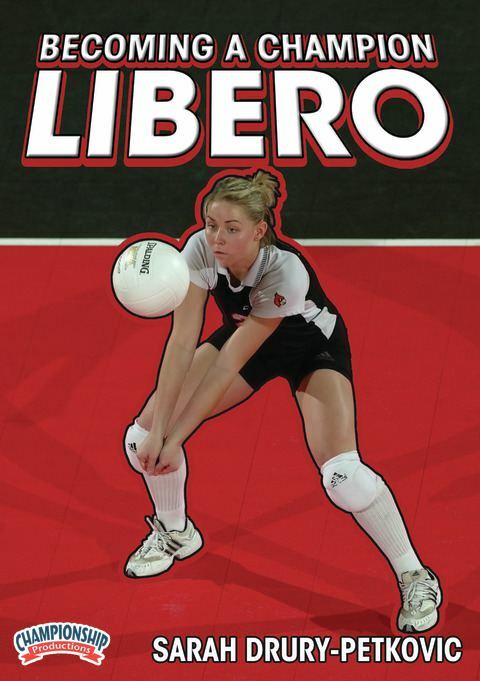 Drury-Petkovic began her volleyball career as a walk-on at Louisville and eventually landed a spot on the US National Team and being touted as the fourth best libero in the world. In this information-packed DVD, Drury-Petkovic arms you with the tools you need to excel at the libero position. Drury-Petkovic embarks on a five-drill passing progression that includes 18 passing drill options. These drills train passing from every angle of the court to develop accuracy in any rotation. Lanes Narrow Drill – A basic-to-advanced progression that incorporates movement patterns with passing. Serve Receive Drill – A two drill set that works the basic fundamentals of passing. Angle Passing Progression – Develop passing accuracy when you’re forced to play a ball outside of your body. This progression takes the player from basic kneeling drills to drills that add movement and more difficult serves. Drop Step Passing – Fundamentals for passing the balls that get behind you. Hollowing Out Drill – Learn to fight off the balls that get into your body. Collapse – This progression teaches you how to “pop up” those hard-driven, low balls and keep them in play for your team. Dig and Roll – Extend your range and dig balls that are far outside your body. This five-drill progressions begins with minimal movement and progresses to a dig and roll. Base to Read Technique – Develop the footwork and timing you need to read and dig tough balls. Overhead Digging – Learn key techniques for keeping those high, hard driven balls in play while still being in position for a low ball. To complete the libero skill set, Drury-Petkovic discusses and demonstrates skills for out of system setting. Learn how setting from the libero position is different than how a setter would set the ball. These slight variations will make a big difference in your success with this skill.Throughout this presentation, Drury-Petkovic constantly teaches and shares nuances of the libero position based on personal experience as a player and a coach. This presentation is great for athletes and coaches alike and is a must have to take your libero skills to the championship level!